We had a ton of fun at the Annual Flanagan Lab Clean-up Day! We got to clean out the walk-in fridge, sanitize incubators, defrost freezers, AND…. (drum-roll please) MAKE SNOWMEN! 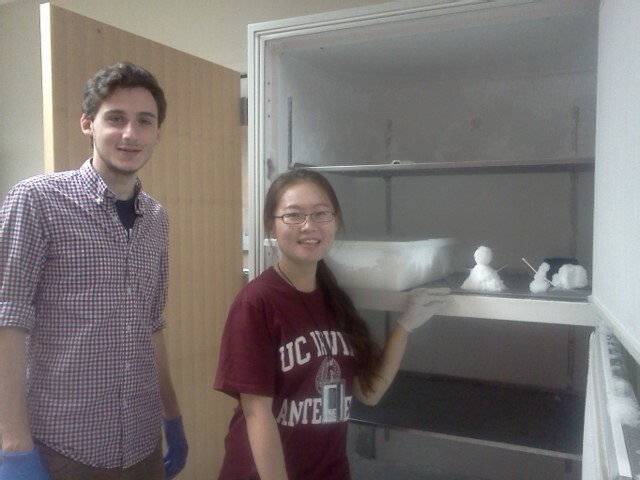 Ying and Adnan demonstrated the proper construction of snowmen using cotton swabs, pipet tips, and “snow” from the -80! Many thanks to our fearless-leader for feeding us and to all the lab members who scrubbed and mopped all day long! The lab looks fabulous! Adnan (L) and Ying (C) and their “snow”men (R)!